I don’t know about you but I’d kill for an After Eight (or fifty) right now. So maybe at one point I will create a recipe for vegan After Eights (but maybe the company could just be nice, indulge my laziness and alter their recipe so we can all enjoy a cruelty-free treat?) but until then, I want to share this one with you. Fudgy chocolate sponge, creamy filling and frosting, the heavenly marriage of chocolate and mint – oh and it’s the perfect size for a small party of diners (read: just for me). Pre-heat the oven to 180ºC (350ºF). Lightly grease or line two 12cm (6 inch) springform cake tins (pans). Combine the dry, sifted ingredients into a large mixing bowl first. Gradually add the almond milk and coconut oil, and finally the vanilla paste. The batter should contain no lumps (though if it does you can do away with them by squeezing them to oblivion against the rim of the bowl with the back of a spoon) and be fairly liquid but not runny. Divide the batter between the two cake tins, smoothing out the tops. Bake for 25 minutes. Cool on a wire rack before removing the cakes from their tins. Spread about a third of the frosting on top of one, sandwich the other cake on top of it, and cover the whole with the remainder of the frosting. Leave for about half an hour in the fridge to allow to set, then devour. Blend until smooth. Spread over the cakes as instructed above. 1. The avocado filling and frosting will turn a little brown after a while. That’s normal – avocados oxidise quickly, meaning that they lose their colour, but that doesn’t mean they’re rotting (not straight away, anyway). If that bothers you, just substitute 250ml (1 cup) of coconut cream mixed with 1 tsp psyllium husk for the avocados (as in this recipe). Leave to set in the fridge for at least 1 hour before spreading over the cooled cakes. 2. One flax egg = 1 tbsp ground flaxseed mixed with 3 tbsp warm water, combined in a small bowl and left to gel for a few minutes. 3. The almond milk needs to be slightly warm because when the melted coconut oil comes into contact with the rest of the ingredients, which are cold or at least at room temperature, it will harden instantly. You can also just leave your ingredients at room temperature for a while before starting baking. 4. If you like your chocolate sweet and mild, stick to 2 tbsp cocoa powder. If you’re a lover of the darkness, go for three. If you’ve tried any of my nostalgia-inspired recipes, which one was your favourite? Like what you read here? Let’s keep in touch! Sign up for email updates and follow me on Twitter, Facebook, Pinterest and Tumblr! You can also follow my blog through Bloglovin‘. Ah! You wonderful person! I’d literally been eyeing up a packet of After Eights in the shop the other day and lamenting their lack of vegan-ness, then you post a recipe for AFTER EIGHT CAKE?!? :D Have a mint plant at the moment as well, wonder if I could use it in this? Yes, I’m sure you could use fresh mint! You might need to add quite a big handful to get a strong flavour, so stop the blender regularly, dip in a spoon and taste the frosting. I love your mini cakes! I’m usually cooking just for me but still want to eat cake so mini is the answer! I actually never liked after eights (it was the gooey filling I didn’t like) but I do love the mint-choc combo. 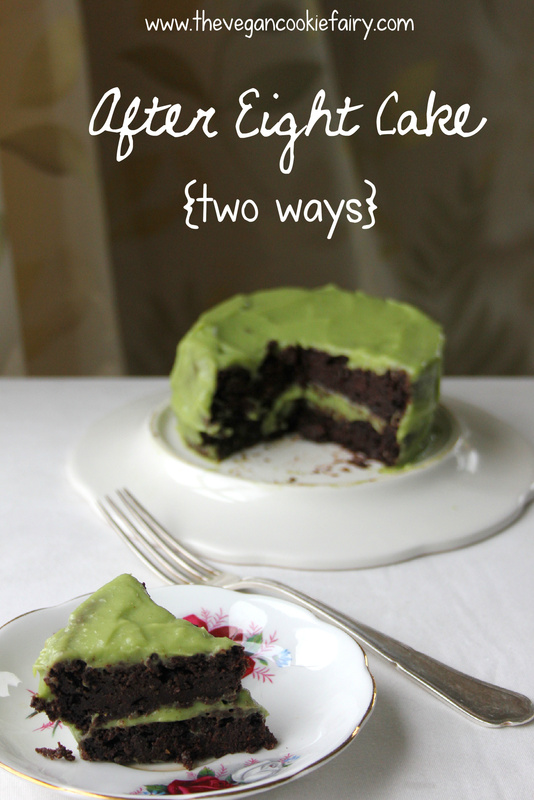 Such a fun idea to use avo for the green topping too. Thanks! It was definitely worth investing in two wee cake tins 🙂 Makes less waste if a recipe fails, too! Avocado and peppermint, wow! What a really nice combo and healthy frosting too! Definitely using this on my next cake (which pops up one after the other). I was in Scotland for a little while, my other half was working in Dundee. We both really loved the place. What a beautiful country, we’d love to settle there by the sea. Thank you! I took a train to Aberdeen recently and we passed through Dundee, which just looks like the loveliest place. Maybe they have a veggie café/restaurant? I don’t think there were any veggie places there. Maybe there are now. But they did have a healthy one called The Tasting Rooms where you could get some options with minor adjustments made to the dish. Unfortunately it’s closed now. What about The Parlour Café? I think they do veggie dishes with adjustments for vegans, I think I saw that on HappyCow.net. Its 8.38am here…that’s after 8…right?…RIGHT???!!! 😉 I have no avocados…it’s almost winter here so I am going to do what any inventive little vegan would always do (rather than don a balaclava and hijack a supermarket truck for a carton of that purest green…) and make chocolate sweet potato frosting to top these little babies. Needs must ma’am when you are after a chocolate fix after 8! It’s always after eight somewhere!! 😉 Haha, great minds think alike! I used to be a big After Eight fan when I was little but when I became vegan I found out about Bendick’s Bittermints which are not only vegan, they are also a lot mintier and not quite as syrupy sweet as After Eight. I looove them!